The significant biological role of RNA has further highlighted the need for improving the accuracy, efficiency and the reach of methods for investigating RNA structure and function. 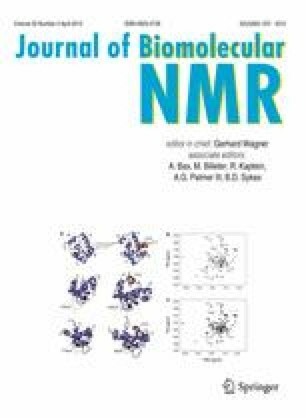 Nuclear magnetic resonance (NMR) spectroscopy is vital to furthering the goals of RNA structural biology because of its distinctive capabilities. However, the dispersion pattern in the NMR spectra of RNA makes automated resonance assignment, a key step in NMR investigation of biomolecules, remarkably challenging. Herein we present RNA Probabilistic Assignment of Imino Resonance Shifts (RNA-PAIRS), a method for the automated assignment of RNA imino resonances with synchronized verification and correction of predicted secondary structure. RNA-PAIRS represents an advance in modeling the assignment paradigm because it seeds the probabilistic network for assignment with experimental NMR data, and predicted RNA secondary structure, simultaneously and from the start. Subsequently, RNA-PAIRS sets in motion a dynamic network that reverberates between predictions and experimental evidence in order to reconcile and rectify resonance assignments and secondary structure information. The procedure is halted when assignments and base-parings are deemed to be most consistent with observed crosspeaks. The current implementation of RNA-PAIRS uses an initial peak list derived from proton-nitrogen heteronuclear multiple quantum correlation (1H–15N 2D HMQC) and proton–proton nuclear Overhauser enhancement spectroscopy (1H–1H 2D NOESY) experiments. We have evaluated the performance of RNA-PAIRS by using it to analyze NMR datasets from 26 previously studied RNAs, including a 111-nucleotide complex. For moderately sized RNA molecules, and over a range of comparatively complex structural motifs, the average assignment accuracy exceeds 90%, while the average base pair prediction accuracy exceeded 93%. RNA-PAIRS yielded accurate assignments and base pairings consistent with imino resonances for a majority of the NMR resonances, even when the initial predictions are only modestly accurate. RNA-PAIRS is available as a public web-server at http://pine.nmrfam.wisc.edu/RNA/. The online version of this article (doi: 10.1007/s10858-012-9603-z) contains supplementary material, which is available to authorized users. Arash Bahrami and Lawrence J. Clos contributed equally.